The CBTR range of backward curved, high pressure, centrifual fans are specifically designed for use in many special "hot air" extract applications where the extraction of heated dust and particulate atomospheres is required. The CBTR fan is particularly suited for localised extraction, machine cooling, process plant cooling and dust/particulate extract applications. 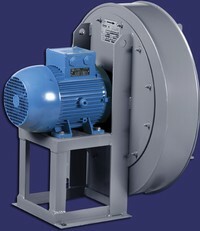 CBTR fans are available with 3ph 400V 50Hz asynchronous motors which include IP55 protection and class F insulation. 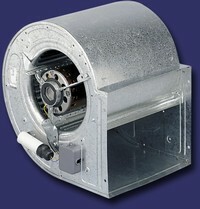 All CBTR fan casings are manufactured from electrowelded steel with totally sealed scroll assemblies. All models are rated for continuous operation/ extraction of airstreams up to +80 Deg.C. Airflow performance ranges from 1,720 up to 5,660 m3/hr. Dependant upon the application the CBTR fans can be supplied with Two Speed / Dual Pole (2/4) motors - please enquire. A comprehensive range of accessories are also available to compliment any given installation. The CBM series of forward inclined, double inlet, direct drive centrifugal fans are designed to be incroporated into OEM installations such as air handling units, kitchen extract systems and other applications that require the extraction of contaminated air. The high pressure forward inclined impellers offer exceptional airflow and pressure development characteristics when combined with the factory matched 1ph 230V 50Hz or 3ph 400V 50Hz asychronous motors. All CBM fans are available with either Open (IP20) or Totally Enclosed (IP44) motor construction and with standard Class B (-40 to +40 Deg.C) or optional class F insulation (-40 to +70 Deg.C. All models are supplied as standard with a prewired electrical wiirng junction box fitted to the side of the fan casing. Airflow performances range from 300 up to 12,000 m3/hr. All motors included in the CBM series are suitable for speed control using voltage regulation with S&P electronic or auto-transformer controllers. To compliment the CBM fan range a wide range of accessories such as mounting flanges, feet, ductwork connectors and speed controllers are offered to complete any given installation. מפוח צנטריפוגלי כפות קדימה מדגם CBM חד פזי , עם כניסת אוויר משני צידי המפוח , בלחץ נמוך. מיועד להעברת אוויר למיזוג אויר, יניקה ממטבחים , יניקה ממוקדי רוח ואיוורור כללי. בעל תפוקת אויר של 1400- 14,480 מק"ש..
המנוע 1/3 כ"ס 900 סל"ד למפוח 9X9. המנוע 1/2 כ"ס 1400 סל"ד למפוח 9X10. המנוע 1/2 כ"ס 900 סל"ד למפוח 10X10. המנוע 3/4 כ"ס 1200 סל"ד למפוח 12X12.